In addition to Patient Self Service Check-in, the new system was required to reduce patient queues and improve patient experience. St. James’s also required the new system to allow patients to update their contact details, review demographic information and confirm their next of kin. 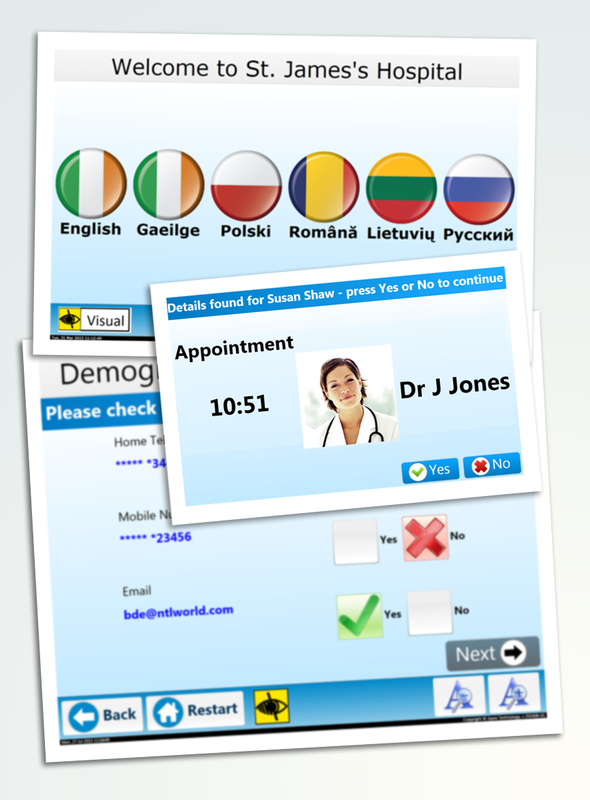 Patients can also participate in structured surveys designed and managed by hospital staff. Enlighten is the next generation end to end multi-channel (Kiosk, Web and Mobile) patient engagement platform. The platform comprises of a number of modules such as the preregistration portal, check-in kiosks, patient calling, patient flow processing, checkout, way finding & surveys. Grapevine worked closely with Jayex Technology and St. James’s IT, Clinical and Administration staff to implement the Enlighten self service solution in a phased approach with different clinics deploying Enlighten over a period of time. This allowed the hospital to manage staff training, minimize the impact on patient workflow and ensure a successful launch of the new system. View the case study on how St. James’s hospital improved patient services with Enlighten Self Service Check-in Solution.